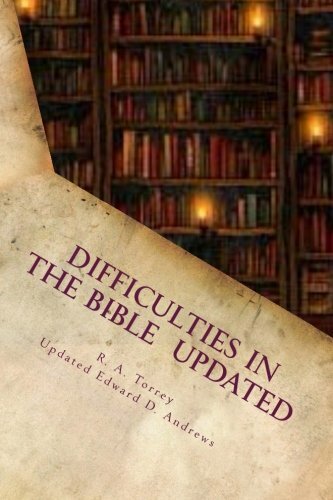 Expanding on R. A. Torrey's original Difficulties in the Bible, Edward Andrews answers today's most challenging questions raised against the Bible. Taking the most difficult passages of the Bible and addressing them with humility and determination, Andrews sheds light on the biggest stumbling blocks of Scripture, from the scientific issues of the creation story to historical and genealogical issues of early mankind. For anyone who wrestles with doubt concerning the accuracy of the Bible in matters scientific, historical, or literary, Difficulties in the Bible Updated provides answers, hope, and truth in the text that informs our faith. When it comes to defending the Bible from textual, scientific, and historical criticism, Edward D. Andrews has everything you need to begin your study. Written for the eager newcomer to Bible interpretation, textual criticism, and apologetics, these volumes seek to definitively answer any complaint or argument against the Bible's divine inspiration. Andrews, Edward D./ Torrey, Reuben A.